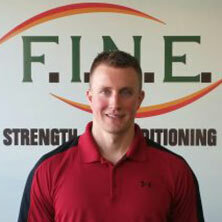 FINE is a perfect PT studio and Colin is the most amazing trainer I’ve ever had. I’ve been working with him for at least 6 years and followed him to FINE when it first opened. The studio is clean, bright, has ample meter parking and free towels. I have friends that do the small group classes who also love it. For me, I like the 1:1 attention of PT. I highly recommend this studio! !